The Magnum Energy ME-AGS-S auto gen start module is designed to automatically start your generator based on low battery condition or the inside room temperature. It does not require an inverter/charger but works with any system and most any electric start generator. 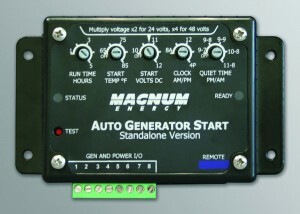 The Auto Gen Start settings do not interfere with the manual start/stop operation of the generator. Just use any existing start/stop switch for your generator. Also available as a network version.